Over the past 15 years, so many professionals have been trained on several Administration courses, following unique teaching methodology and excellent lab facility that Radical Technologies offers. Most of these are associated with reputed organizations in India and across the globe. 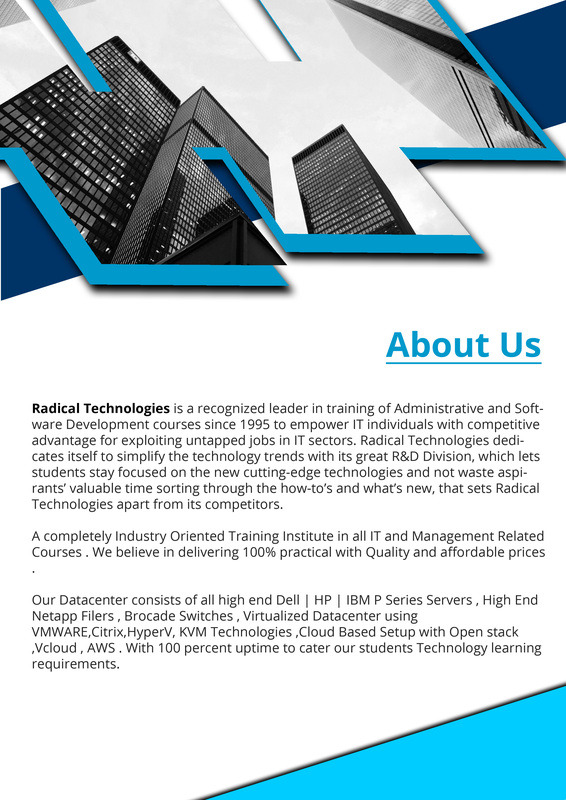 Radical Technologies holds credit for a phenomenal rise in producing trained professionals every month. Radical Technologies is truly progressing and offer best possible services. And recognition towards Radical Technologies is increasing steeply as the demand is growing rapidly. Radical Technologies has a group of highly experienced and qualified faculties. They are always dedicated towards improving the students, and make them learn more, with their experiences. The faculties here are always concerned about all round development of students, all the things taught by them is not only theoretical, but special measures are taken by them to make students get their implementations too. We have labs, loaded with many servers like Sun Sparc, IBM AIX Power series servers, HP-UX Servers, VMWARE servers , and using these, students are taught whatever the best they could be. The teaching faculties we providing are well experienced corporate real time trainers from well known MNC’s. The Faculties apart from their normal duties of delivering lectures are conducting practicals based on real time scenarios from their world of experience. The mock interview programs provided by us is the best ever given in the Industry ,which improves the student’s ability to tweak interviews. The interview tries to resemble a real interview as close as possible, and provide experience for the candidate.